Hey all! It's the end of February, winter is (slowly) starting to wind up, and I can feel spring starting to rustle. Now, as I am writing this, it's snowing like crazy outside, but I know spring, and she's getting ready. Also at the end of this horrible fine month is a blog hop I've been super excited about with some of my darling vintage pals- Thrift the look. You all know I love thrifting- Tim says I have my own gift shop in the basement full of treasures (my word, not his) I have collected. He wanted to take someone downstairs to shop it just last night. This idea is the brain child of the crazy talented Sarah, over at Sadie Seasongoods- and this is my first time jumping on the bandwagon. 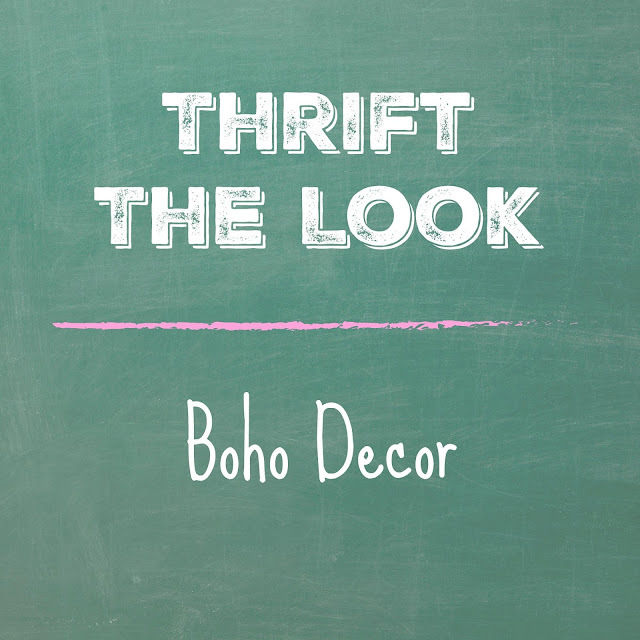 It's a pretty simple idea- we come up with a theme (this round is Boho decor), find an inspiration pic and try to recreate the look using thrift store treasures. In theory, it should be. The first hard part was finding a picture we all liked. In the past challenges, everyone worked off of two images to recreate one of those looks . For this challenge, no matter how hard we tried, that just didn't jive. So this time, we decided we would all find inspirations of our own and work from there. I think Bohemian style is really personal, so if the image doesn't speak to you- it's going to be hard to buy in. Now, my style isn't super boho, so it took some diving in on Pinterest and Instagram to find something that felt right- like I could do a riff on it and you would be able to see my own style coming through in the end product, not just a straight up copy or something that looks like I am trying too hard. Here's the gorgeous pic I chose as my inspiration. I had my image, now I needed to go thrifting. With everyone giving away ALL OF THE THINGS a la Marie Kondo- I thought this would be easy and I would be able to knock it all out in one haul. Ha ha, again. I think I made a good 5-6 trips until I found things and found enough things. That's the thing with thrifting- you might know what you want, but that doesn't mean you're gonna get it. I am talking about you, baskets. I also grabbed some plants at a greenhouse- cause you can't do boho decor without a few (zillion) plants. No oranges were thrifted in the making of this blog post- cause that is gross. Obviously, there's a whole lot more items than what I picked up for this challenge- however almost all are thrifted too. Bohemian is a collected look- and as we all know, I'm a bit of a collector. It's not a structured, by any means - it's textures and layers and pops of colour, and it all just kind of flows together. It's not a look for everyone, but that's what makes life interesting. On this side of the stove, I have a collection of wooden utensils in an old crock (not thrifted), along with another collection of cutting boards (all thrifted), a green enamel pot (thrifted), my fern- Tim Ferny- in another enamel pot (thrifted). On the shelves I have that small copper pot I thrifted for this challenge with a string of pearls plant, another thrifted copper planter with some succulents and a set of wooden bowls (thrifted). The basket vase, and black metal basket that I thrifted for this challenge, a brass pear bell (thrifted) and two wood vases (thrifted) filled with some faux silver dollar eucalyptus. On the shelves, the flat baskets I thrifted for the challenge, stemless wine glasses (thrifted too! ), an old coffee can (not thrifted, but I got it from my dad's garage, so that's close enough! ), the floral metal tin I thrifted, some old cookbooks of my grandmother's, a faux succulent and some old Roseville pottery vases that I saved from the junk. And there's that tea kettle, can you tell I love that thing? And then the basket sewing bag thingamajig I thrifted with a plant, a lavender topiary in a planter from Winners and my little wall hanging I made with the thrifted fabric trims. So as you can see, I didn't specifically thrift all of this look at once- but, inadvertently over time, I had. I loved putting this look together- I won't keep it just so, but some elements I definitely will and the other ones I will work into the decor in other places around my house. Don't be afraid to branch out a little in your decor like this- try to thrift this look or another one that you have an itch to try out yourself. And if you need someone to go to the thrift store with you, I'm your gal! And of course, make sure you visit the other bloggers who are thrifting their own boho room decor vignettes. Just click on their blog name(s) to be magically transported to their blog posts. OMG, I love it, you did so good! Boho is my jam, I am in the process of bohoifying (that's a technical term, lol) my whole house! This looks so wonderful, Laura! You have styled it so beautifully and really captured that feeling! So fun doing this challenge with you! Your kitchen is awesome, Laura! Now I'm wanting a new house;) You did awesome with this challenge and it works so well in your space. That purse/sewing bag is the bomb! You found great stuff to pull it all together. Seriously...this could be on the front of a magazine! AMAZING job!!! And I am 100% envious of your kitchen- it was custom made for this challenge. You slayed today with this! I freaking love how you plunked that plant in a purse! So wonderful. You knocked this Boho challenge right out of the park! I think you totally captured the look and feel of your inspo pic. And whoa, all.that.copper! Love it! I'm a sucker for the warmth of copper. Actually that's the feeling I got with what you did - your kitchen looks warm and inviting with your Boho touch. So awesome!! Love your interpretation of boho! Nice work. Beautiful! I especially love the sewing basket with the plant. Your kitchen, it's deadly!!!! (that's good in East Coast lingo) I adore all of the copper and I feel like the nerd that's pointing and yelling at everyone... I have that same copper kettle! We're friends, twins!!!! HA seriously though your boho kitchen is perfectly you with a splash of the best ever thrifted boho finds. And, if Bud offered my stash for shopping, I think there'd be words!!!! That knitting bag turned plant holder is amazing! I love the circles on it. Shout out to Marie Kondo for encouraging people to share their goodies! Its the best time to hit up the thrift stores...I've had to ground myself from going...got a little carried away last time.